The $605,000 the county plans to spend on Daniells Bridge road improvements in the next three years will be only a “patch,” Oconee County Commissioner Jim Luke said in response to a question from a citizen at the Feb. 16 town hall meeting. That “patch” will not include bike lanes or sidewalks, Luke said. Such improvements will not be made until the county decides to bring the road up to state standards at some unspecified period in the future. The question about the road came near the end of the meeting, when Karen Kimbaris asked about the construction underway on the Daniells Bridge road and Oconee Connector intersection and about plans for additional improvements to Daniells Bridge road. BOC Chairman Melvin Davis was the only other commissioner to respond to the question. He said construction of the Oconee Connector Extension, also called the Jennings Mill Parkway, will include bike lanes, as will the proposed widening of Mars Hill road from Butler’s Crossing to the Oconee Connector. Kimbaris also asked about the status of a proposed bike path from Athens to Madison, which has been talked about for years, but neither Luke nor Davis responded to that part of the question. The $400,000 figure used by Luke in his response to Kimbaris was an old figure. The commissioners voted on Feb. 2 to commit an additional $205,000 on top of the earlier $400,000 earmarked for the scheduled Daniells Bridge road improvements. That money is to cover widening Daniells Bridge road from its intersection with the Oconee Connector to just east of the blind curve at Lynn drive. When completed, the road will have three lanes, including a center turn lane. Reconstruction of the intersection itself is underway to accommodate the QuikTrip gas station now being built on the northeast corner. 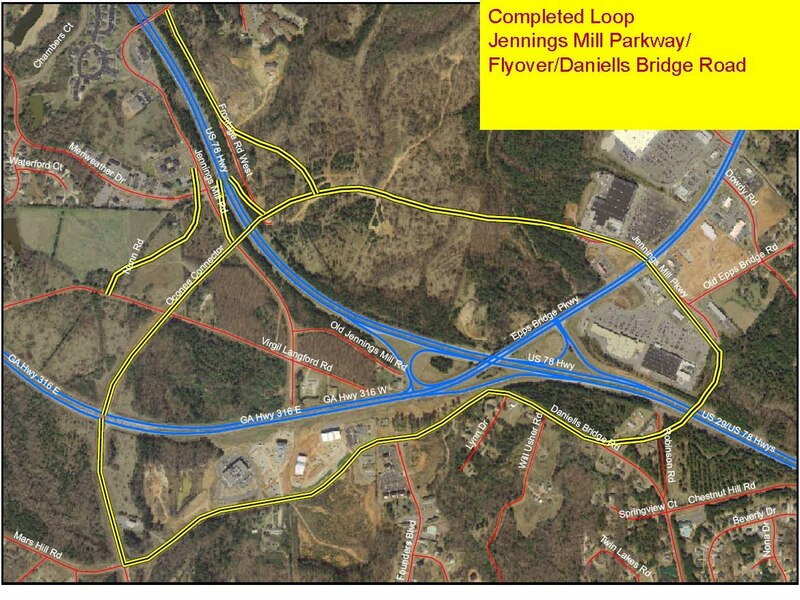 Standardization of Daniells Bridge road to three lane with turn lanes from the Oconee Connector intersection to Founders boulevard will be completed this summer, County Public Works Director Beshara said late last month. Beshara said at that time he planned to wait to do work on the roadway beyond Founders boulevard until the proposed office park is built on Daniells Bridge road just east of the blind curve. Beshara told the BOC at the end of 2008 when it approved the office park that Daniells Bridge road could not be upgraded to four lanes, as is planned for some point in the future, at its present location without additional right of way. He also indicated that it would be better to create a new road behind the current houses on Daniells Bridge road, thereby straightening the roadway. The county plans to build a flyover from Daniells Bridge road to behind Home Depot as part of a full loop around what it plans to be the county's prime commercial hub. The loop is being built piecemeal, and the $605,000 “patch” is being made until the county decides what to do with the southern part. Bike lanes are expensive (at least $600,000 per mile just for construction costs), so this is why the county will not install such lanes unless it is a GDOT project. GDOT projects include bike lanes by mandate as Davis alluded to. Sidewalks are also expensive ($60 per linear foot). So it's a simple case of passing the buck. I can understand that. What I do hope the county will commit to in the short term is better signage and road markings for cyclists (Share the Road signs and painted sharrows). In the long term I think this sort bike-pedestrian infrastructure should be included in SPLOST initiatives. This will allow the citizens of the county to have more directed input on where such infrastructure should be placed.